I haven’t seen what, if any, story updates Sarkhan has had since Dragons of Tarkir, but something feels different and he doesn’t seem to be messing around any more. This M19 iteration is about dragons, lots of dragons, and there are so many reason for players of all inclinations to be happy about that. The casual crowd will love that he generates any color or colors and helps them cram every cool dragon they like into their deck, and the competitive crowd will love that he comes down at a great point in the mana curve to overwhelm opponents with Elder Dragons and the like. Everyone will love an ultimate that generates a scourge of dragons with twenty power, not to mention synergy with madness cards on the way there. Curiously, his first +1 ability functions very nearly the same as Jalum Tome from Antiquities, especially when you take into account that each can only be used once per turn barring some kind of weird combo. I wonder if that’s a coincidence, or if Urza discovered some secrets he never let on? 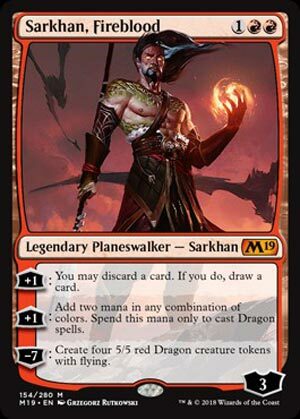 This Sarkhan, at least, is priced to move; Dragons are historically one of the more expensive tribes to cast spells from, and so Sarkhan coming out costing only three mana positions him well to help you cast a six-mana Dragon on turn 4 with one of his +1 abilities. Like, say, the newest Niv-Mizzet. His other +1 is card filtering, and red’s tendency to not draw cards well means that it wants as much filtering and support that way as it can muster. Card filtering when you need it, mana also when you need it…Sarkhan is not the centerpiece of the Dragon deck, but he helps a lot in greasing the axles and making it easier for the deck to get rolling. His ultimate is more fanciful than useful, thanks to him needing to be out for 5 turns unanswered to use it, but four 5/5s with flying can end a game in short order! It also pairs well with Sarkhan the Mad (from Rise of the Eldrazi) and his -4, if such is your fancy.